Witness history in action with Northumberland’s finest local volunteer artillery regiment! Observe thrilling live firing displays and military drill re-enactments, performed by the Duke of Northumberland’s very own artillery unit. The Percy Tenantry Volunteers (PTV) Northern and Southern Divisions were established in 1798 by Hugh Percy, the 2nd Duke of Northumberland. Threat of a French invasion through Northumberland’s ports necessitated the formation of a large defence force. This force which consisted of cavalry, infantry and artillery volunteers was raised from the civilian population. As the threat subsided, the group disbanded; however, the artillery component continued to operate through private funds provided by the Duke of Northumberland. Between each firing display, you can observe the costumed infantry and their numerous arms. View the weapons capable of penetrating heavy armour including the musket and those with explosive tendencies such as the battery gun. Listen to harrowing stories of courage and heroism, as well as learning more of the formation of the PTV through the period’s historical context. Volunteers provide enlightening talks on how weapons and ammunition were transported, stored and used, the PTV’s uniform choice, as well as the unit’s role in local defence. So why not come down and meet the Percy Tenantry Volunteers this May Bank Holiday (4th – 6th May) and learn more about local history! 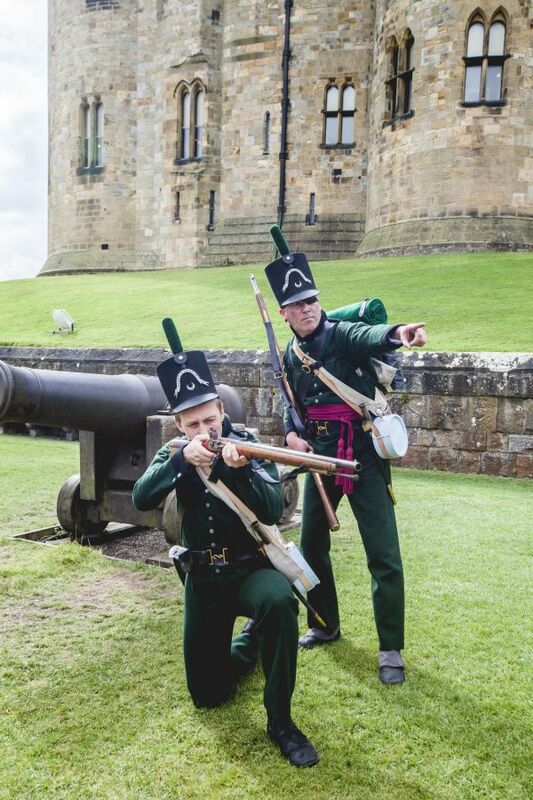 These terrific firing displays and drill re-enactments are free with admission to Alnwick Castle! Please check the ‘What’s On’ board upon arrival for show timings and locations, as these can vary throughout the season.